Only four more Saturdays without baseball. Pretty cool. The Grapefruit League is about a month away. Anyway, here’s some news and notes on this baseball-less Saturday. According to Ken Rosenthal, the MLBPA has formally rejected commissioner Rob Manfred’s latest pace-of-play proposal. That paves the way for MLB to implement rule changes unilaterally, which is expected to happen. By rule, MLB can only implement last year’s proposal, which includes a 20-second pitch clock at all times and a limit of one mound visit per inning by the manager, a coach, or another player. A second visit necessitates a pitching change. The new proposal that was rejected included an 18-second pitch clock with the bases empty and no pitch clock with runners on. MLB and the MLBPA will meet again next week to continue talking, but at this point, Rosenthal says the players are upset and have drawn a line in the sand. They’re expected to reject any proposal. Rosenthal also says players and agents are frustrated with MLBPA chief Tony Clark given how many concessions the union has made recently. That was bound to happen, I guess. I’ve said this before, but I am all for a pitch clock and a limit on mound visits. 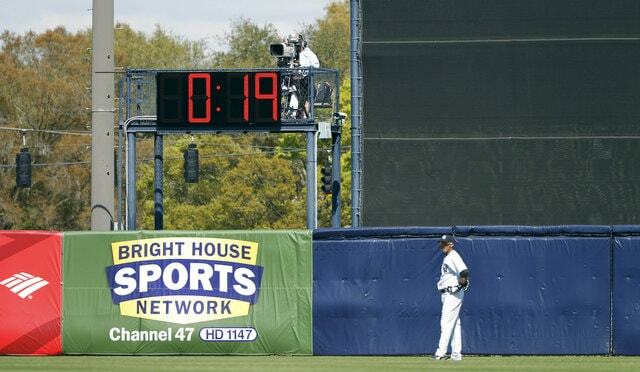 There is a 20-second pitch clock in the minors and it doesn’t hurt the product at all. It’s barely noticeable. As for mound visits, well those are getting to be out of control. It seems like every pitch in the late innings of a postseason game requires a pitcher-catcher conference. These measures are not the solution for all of baseball’s problems, but they’ll help reduce the downtime within a game, and that is a-okay with me. Martinez, 21, is still going through the process of establishing residency and getting unblocked by the Office of Foreign Assets Control, so he is not yet eligible to sign. Interestingly enough, Badler says the Yankees have “limited bonus pool space available for 2017-18,” indicating most of the $3.5M in leftover Shohei Ohtani money is gone. Raimfer Salinas and Antonio Cabello must’ve received nice bonuses. Because of the bonus pool situation, Badler says Martinez may wait until July 2nd to sign with the Yankees so he can tap into their 2018-19 bonus pool. Dellin Betances told George King he is working on his mechanics and fastball command this winter, because duh. “Last year I went back and forth between mechanics. I just got to focus on one delivery and repeat that. Obviously, for me, being taller it’s harder for me to repeat. I have to trust what I do in the offseason and take it into the season,” he said. Gary Sanchez worked with strength and conditioning director Matt Krause this winter and has dropped weight, reports King. 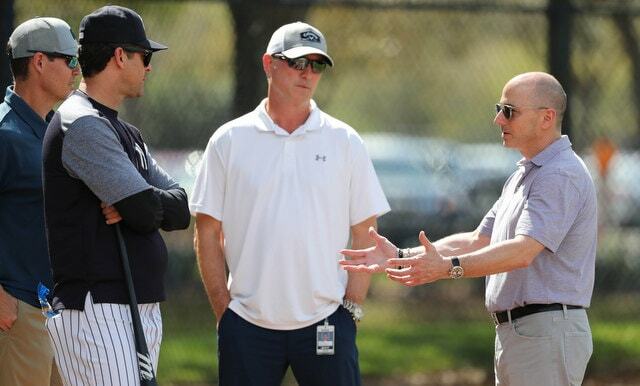 A few weeks ago Brian Cashman mentioned the Yankees believe Sanchez bulked up too much last offseason, so he’s working to correct that, which might help him do a better job blocking pitches. We’ll see. Also, Baseball America posted a Yankees prospect podcast last week, so check that out. Thirty-three minutes of prospecty goodness. The podcast is free for all. No subscription necessary.